Entrepreneur Martin Schreibman is raising thousands of tilapia in tanks residing in a Brooklyn warehouse, in an attempt to create a sustainable fish farming business. Raising fish in the inner city may seem a bit out of place, but urban aquaculture addresses many health, environmental and economic issues associated with conventional commercial fishing. Currently over 1 billion people rely on fish as their primary source of protein, because of this many areas are being overfished causing species depletion and environmental damage. If a region is damaged too much, the fish simply won’t come back and the area won’t be productive anymore. This is one of the reasons that fish farms were created, but these have their own issues as well. 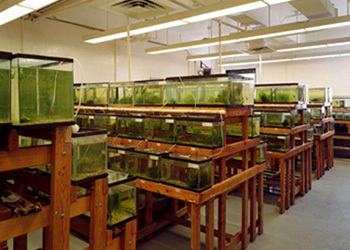 Conventional aquaculture setups use floating pens in natural water systems, and so the fish are exposed to whatever may be in the water such as mercury and PCBs. Due to the dense populations of the fish farms, the fish are given antibiotics to keep them healthy. These antibiotics escape the nets and impact other aquatic life, as well as becoming part of the fish tissue to be consumed by humans. Urban aquaculture is done in a controlled environment and thus requires little if any antibiotics, contains no mercury or PCBs, and the temperature and nutrient supplies can be closely monitored and controlled. Another often overlooked benefit to urban aquaculture is transportation to market; the closer the fish are raised to the people that will consume them, the less energy is required for transportation. Urban aquaculture alongside urban farming could be a very sustainable solution to the problem of feeding hungry cities, especially in areas where farmland is scarce or coastal waters are too polluted for conventional fishing.